See just how extensive your way with words can be with this brand new compilation of the trickiest Cryptic Crosswords to date. 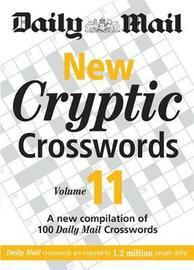 No matter how many you've taken on in the past, New Cryptic Crosswords Volume 11 is sure to keep everyone entertained and leave puzzle-fanatics gripped to the grids. Perfect for whiling away the hours at home, on holiday or during the daily commute, you'll soon be experiencing that awesome feeling of seeing your frustration come to fruition, and be inspired to conquer the previous bestselling Daily Mail Cryptic Crossword volumes.